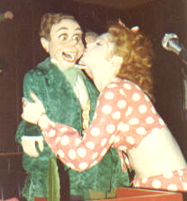 Ted Lloyd, in addition to being a top-notch ventriloquist, was also a very talented writer. 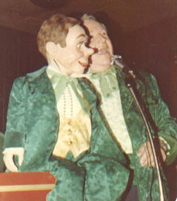 When Lloyd passed away he left behind a trunk full of original radio plays, poetry, songs, stories and comedy routines. 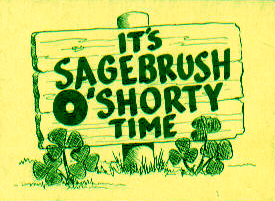 Here is a portion of a sketch that Lloyd performed with his ventricular partner Skinny Dugan in nightclubs every St. Patrick's Day. 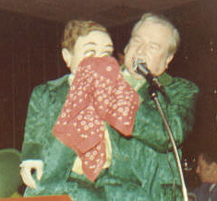 Lloyd had green velvet suits custom made for both himself and Dugan just for the occasion. And I’ll punch you in the eye! DUGAN: Be careful, or you’ll get no pot at the end of the rainbow! TED: You’d leave me no pot? DUGAN: If I did, you wouldn’t like what was in it. TED: Isuppose it would be empty. DUGAN: Yeah, then it would fit you,- a crack pot! TED: I’ll bet you don’t even know any real Irish songs. DUGAN: Of course I do. I know ‘em all. TED: Do you know Molly Malone? TED: I’m speaking of the song. TED: It sounds like you’re sick. Maybe I’d better sing. DUGAN: Then we’ll all get sick. TED: Go on, let’s hear the song; I said foolishly. TED: Those are not the words. TED: I’m sorry I brought it up. DUGAN: She slapped my face. Till it comes out the other side! Leprechaun. You don’t even have the right to wear green. DUGAN: I’m glad you’re wearin’ green. DUGAN: It matches your complexion! TED: I think you’re the one who needs a punch in the eye. TED: I can see you never kissed the blarney stone. DUGAN: Never! Who wants to kiss an old stone. I’d rather kiss a girl! TED: That’s it! Off you go! TED: You’ve had too many chances already. TED: Okay, I know I’m crazy but, just one more try. Let’s go look for the thing. Before we get too darned old! TED: Come on now, sing it right. You’ll get it in the eye!